The incident began with Riverhead police searching for Roger Makowski, 59, who was driving a black Volvo sedan around 10 a.m. on Peconic Bay Boulevard, officials said. Officers in Riverhead alerted Southold to keep an eye out for the vehicle since Mr. Makowski had a warrant from Riverhead Town Justice Court, police said. A Southold officer spotted the Volvo speeding eastbound on Peconic Bay Boulevard, initiated the pursuit and attempted to pull the vehicle over on Bay Avenue, police said. Officers also attempted to stop the car in front of police headquarters in Peconic with spike strips, but Mr. Makowski, who was the only person in the car, avoided it by driving around, officials at the scene said. 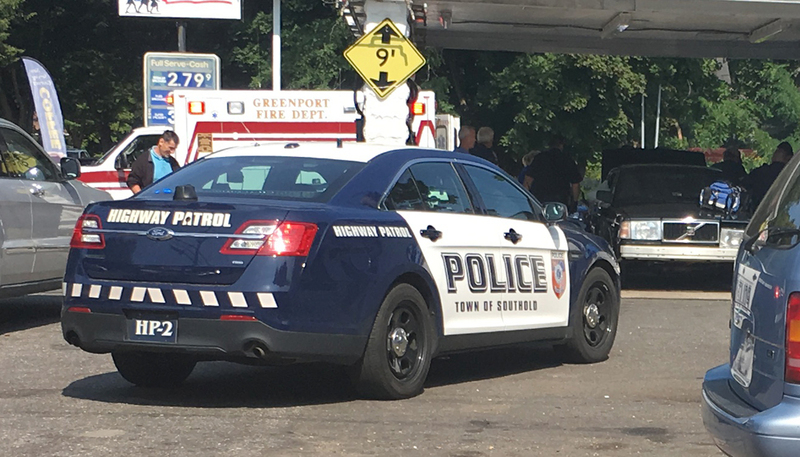 The pursuit continued into Greenport before coming to an end at the Patriot gas station on Main Street shortly after 10:30 a.m.
Mr. Makowski was transported via Greenport Ambulance to Eastern Long Island Hospital for evaluation, police said. He was charged with misdemeanor unlawfully fleeing police and was taken into custody by Riverhead police, officials said.